Heraeus is an LBMA approved German refiner that produces high-quality precious metal products that are valued by the world's leading investors and traders. 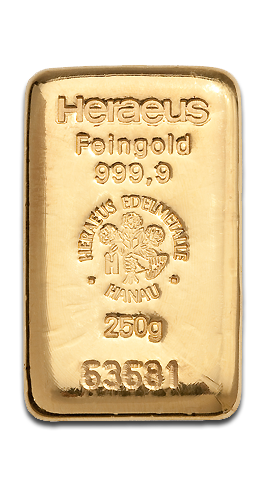 All Heraeus investment bars are stamped with a unique serial number and come with a signed certificate of authenticity. The 250 g cast bar is a favourite with serious investors and is often selected by people who want to keep their pension funds in gold. Each bar contains 250 grams of the finest .9999 pure 24 carat gold and has been hand cast by expert craftsmen. Hand cast bars are treasured for their attractive appearance and the 250g Heraeus gold bullion bar measures 50.5 mm x 30. 5 mm x 9mm. The 250 g size is satisfyingly robust and it represents excellent value in comparison with smaller gold bars. You will also enjoy speedy, insured delivery and exceptional overall service when you buy gold with CoinInvest.com. As a major trader of coins and precious metals, we are able to offer Heraeus 250 g gold bars at the most competitive prices. We assist our clients in finding the best possible investment opportunities and offer a wide range of high-quality products for new and established investors.